This location has been the subject of some controversy in the Municipality Quest. 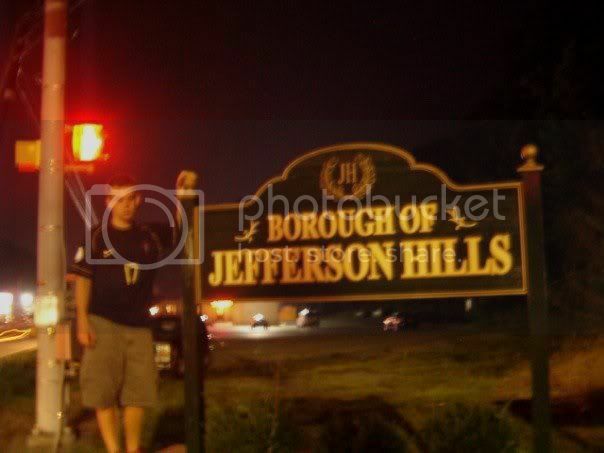 On the map it is listed as "Jefferson" but everyone calls it "Jefferson Hills". We had to get to the bottom of it. Well, here is the scoop. Apparently it was a township forever and then incorporated as a borough known as "Jefferson". Recently, 1998 to be exact, residents voted to change the name to Jefferson Hills. So, alas, there is no Jefferson Borough. Special thanks to the Jefferson Hills municipal website and the Post Gazette for helping us to sort this out. If you can locate a Jefferson Hills police car in this photo, please alert us. Sure enough, we were stopped by a Jefferson Hills police officer after taking this sign because he noted that we "moved away quickly when we saw his car". Of course, we didn't see his car, which should be a tribute to the dark color of the LAPD -like police vehicle. Now, we don't have a problem with being questioned since we were doing absolutely nothing wrong and were operating on public property but we didn't see the need for the officer to shine a 2 million watt floodlight in Miller's eyes from 3 feet away and we couldn't figure out the rationale of him asking Miller if he knew a certain individual. It is not like there are 1.2 million people in this county. However, we thwarted law enforcement by not driving a stolen vehicle, not drinking and driving and not doing anything illegal. Since the police probably don't have much to do in a well-to-do community like Jefferson Hills, we figure that he was itching for anything other than responding to reports of suspicious squirrels near the high school. Here is another example of PennDOT stepping up to the plate. This "Jefferson Borough" sign really threw us through a loop. 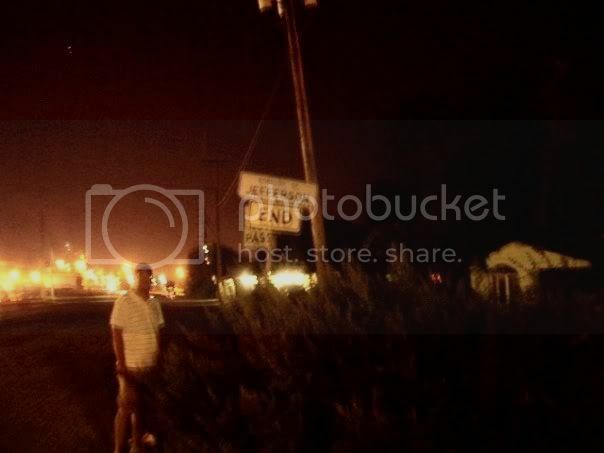 Like the Confederate Flag on the State House grounds in South Carolina, this sign should not be allowed to stand.